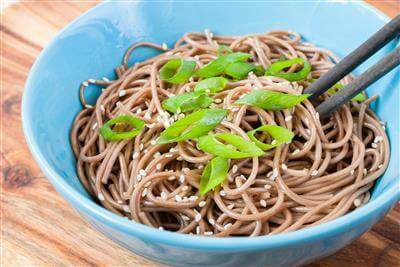 Inspired by the Chinese flavors this highly dressed one-pot side dish is made with soba noodles tossed with sesame oil, ginger, tail bird chili, brown sugar, soy sauce, rice vinegar, chili sauce and green onions and garnished with sesame seeds. If you are looking for easy recipes for an Asian-inspired recipe this one is for you. RecipeSavants.com Inspired by the Chinese flavors this highly dressed one-pot side dish is made with soba noodles tossed with sesame oil, ginger, tail bird chili, brown sugar, soy sauce, rice vinegar, chili sauce and green onions and garnished with sesame seeds. If you are looking for easy recipes for an Asian-inspired recipe this one is for you. Smart Recipes, Chinese Recipes, Grains Recipes, Recipes Grains Chinese Cold Sesame Seed Noodles PT15M Serves 8 Ingredients: 0.5 Pound Soba Noodles 9 Tablespoons Sesame Oil 1 Piece Ginger 2 Cloves Garlic 1 Red Tail Bird Chili 2 Tablespoons Brown Sugar 0.25 Cup Rice Vinegar 0.25 Cup Soy Sauce 1 Tablespoon Chili Sauce 2 Green Onions 1 Tablespoon Sesame Seeds In a large bowl, add all ingredients and mix until well combined. Refrigerate to chill before serving.